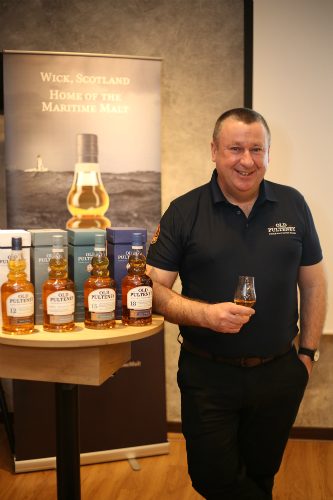 Braving the long trip from the windswept north coast of Scotland to hot and sunny KL, Malcolm Waring was recently in town to bring in the new core range from Old Pulteney – as the 17 Year Old and 21 Year Old have been gradually phased out since last year, they are now being replaced by the 15 Year Old, 18 Year Old and a non-age statement Huddart. We’ve looked at our stock profile and flavour profile to see what we’ve got of the 15 and 18 – they’re both fundamentally different, there’s no sense in having 2 products that are essentially the same. You’ve got the Pulteney style DNA going through, but each individual component brings something different to it. The DNA is the same. They still have the core sweet, salty, estery, floral notes to them as well, but the 15 brings a fresh spice to it, so we’ve further matured it. Both 15 and 18 started off life in American oak, as 12 did as well, but the 12 is 100% American oak. The 15 and 18 we’ve taken to a point in American, and I’ve racked them and then I further matured them in European and Spanish oak – ex-Oloroso casks. It’s the length of time in each one, and where I’ve positioned them in the warehouse. You can go into the distillery and figure out how it works very quickly, but it takes a very long time to figure out how your warehouses work – and the 15 and 18 for me is a play on the warehouse, so I’ve laid them down differently, all in the same type of cask but in different warehouses, and that really adds something different. The 12 Year Old is one of the remaining expressions from the previous core range. The 18 is in warehouse number six, and that used to do the maltings. Right at the very end, where the kiln used to sit, there’s a different microflora to it – it’s like an earthy, musty spiciness, and it really nails into the 18 with that soft spicy earthiness. When the 15 was in American oak it was high up in the racks, which really intensified all the sweet, floral fruits. I’ve racked it lower down in the warehouse and I’ve split it between warehouse number four and three, and they both bring something to the party. All the warehouses started out in life as something different, and each has a different play on it. I don’t think there’s anything wrong with non-age statement whiskies. I think it gives me as a distiller an autonomy…you can bring something different, you can try different cask, different expression. Personally I think it’s a good thing for us, I think it’s a very good thing for the consumer as well, because you can try something you not normally would.